During the cultural revolution in China almost 60 years ago the communist took over the reign of government. American Baptist missionaries thinking that the crisis will soon be over temporarily transferred to Baguio and established the first Chinese Baptist church in the Philippines. The crisis in China became a permanent take over of the communist regime that they decided to stay in the Philippines to establish more Baptist Churches. 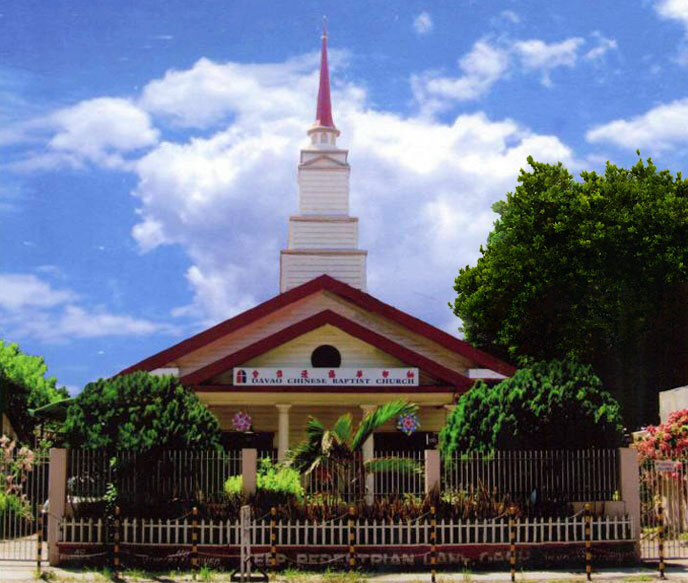 When Luzon was saturated a handful of believers decided to come to Davao to start a new congregation. The church was established on December 29, 1952. The first pastor was Rev. Morino Lim. Most of the members then were middle age and children attend Sunday school thru the effort of one of the organizers. There was only one worship service during Sundays and prayer meeting was Wednesday night attended by Pastor Lim and three others. His prayer request then was a 300 attendance in the worship service and the prayer meeting. 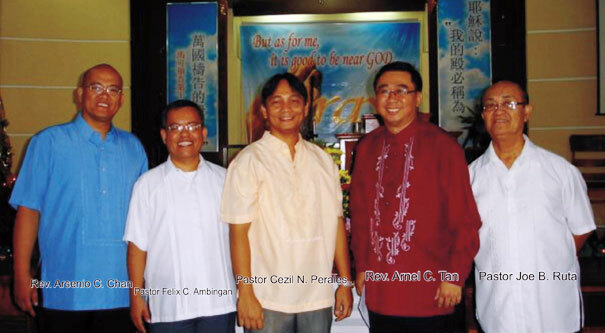 In 1997 Pastor Lim meets Pastor Arnel Tan and after a long talk decided to start the first evening service on the month of July. Three years later, on July of 2000 the morning service was born with an attendance of . Meanwhile, with Pastor Lim leading, the prayer meeting was now in the morning of Wednesdays and the regular attendance rose from ten to twelve. In 2005, the Lord took over our strategies and taught us how to pray intently following an incident which changes the perspective of Pastor Tan. It was Kadayawan and we cancelled the prayer meeting with a big sign at the gate announcing the cancellation “No prayer meeting, enjoy Kadayawan”. When his youngest son Timothy saw the announcement, He commented, “Di ba Dad dapat, yes prayer meeting”? The conviction was so great to Pastor Tan that He promise God that whatever circumstances that may come he will never be absent in the prayer meetings. And God has shown his faithfulness and teaching us in the years that passed to seek Him, to seek the Giver rather than the gifts. Before, we were so concern how many will attend but when we relinquish this burden to Him we became relax when we ask Him to invite people He wants to come and pray. With His grace and mercy we are now averaging from 200 to 300 attendance. As the years go by with the guidance of the Lord our worship services have increased to four per Sunday 7am, 10am, 4pm and 6:30pm with a total average attendance of 1,800 to 1,900. Staffs of four Associate Pastors assisting the Senior Pastor are at hand to minister to the spiritual needs of the congregation. In this church, we do not do anything without first seeking the Lord’s approval. That’s why people come and ask us why we do not renovate the church to make it big so that we can accommodate those who are attending who sometime are already sitting outside the gate. Pastor Tan’s answer is; Let us cleanse our hearts first and give our total surrender to the Lord and the renovation will just come. We do not know what the Lord will do in the future but we believe that He listened and answers prayers of those who have a broken and contrite hearts which He will not despise. You become a Southern Baptist by uniting with a Southern Baptist church, one in friendly cooperation with the general Southern Baptist enterprise of reaching the world for Christ. Typically church membership is a matter of receiving Jesus as your Savior and Lord and experiencing believer's baptism by immersion. Southern Baptists have prepared a statement of generally held convictions called The Baptist Faith and Message. It serves as a guide to understanding who they are. The topics here provide only a brief, partial summary. The full text on the issue discussed is also available on this website. The Scriptures The Holy Bible was written by men divinely inspired and is God's revelation of Himself to man. It is a perfect treasure of divine instruction. It has God for its author, salvation for its end, and truth, without any mixture of error, for its matter. Therefore, all Scripture is totally true and trustworthy. It reveals the principles by which God judges us, and therefore is, and will remain to the end of the world the true center of Christian union, and the supreme standard by which all human conduct, creeds, and religious opinions should be tried. All Scripture is a testimony to Christ, who is Himself the focus of divine revelation. God's Purpose of Grace Election is the gracious purpose of God, according to which He regenerates, justifies, sanctifies, and glorifies sinners. …All true believers endure to the end. Those whom God has accepted in Christ, and sanctified by His Spirit will never fall away from the state of grace, but shall persevere to the end. Baptism & the Lord's Supper Christian baptism is the immersion of a believer in water. …It is an act of obedience symbolizing the believer's faith in a crucified, buried, and risen Saviour, the believer's death to sin, the burial of the old life, and the resurrection to walk in newness of life in Christ Jesus. The Lord's Supper is a symbolic act of obedience whereby members … memorialize the death of the Redeemer and anticipate His second coming. Evangelism & Missions It is the duty and privilege of every follower of Christ and every church of the Lord Jesus Christ to endeavor to make disciples of all nations... to seek constantly to win the lost to Christ by verbal witness under girded by a Christian lifestyle, and by other methods in harmony with the gospel of Christ. The Lord's Day The first day of the week is the Lord's Day. …It commemorates the resurrection of Christ from the dead and should be employed in exercises of worship and spiritual devotion. Cooperation Christ's people should … organize such associations and conventions as may best secure cooperation for the great objects of the Kingdom of God. Such organizations have no authority over one another or over the churches. …Cooperation is desirable between the various Christian denominations. Family God has ordained the family as the foundational institution of human society. It is composed of persons related to one another by marriage, blood or adoption. Marriage is the uniting of one man and one woman in covenant commitment for a lifetime. ... The husband and wife are of equal worth before God, since both are created in God's image. A husband is to love his wife as Christ loved the church. He has the God-given responsibility to provide for, to protect, and to lead his family. A wife is to submit herself graciously to the servant leadership of her husband even as the church willingly submits to the headship of Christ. She, being in the image of God as is her husband and thus equal to him, has the God-given responsibility to respect her husband and to serve as his helper in managing the household and nurturing the next generation... Children, from the moment of conception, are a blessing and heritage from the Lord. Parents are to demonstrate to their children God's pattern for marriage.